Geoffrey James Alexander Bayliss was born in Nyaunghla (Nyaung-U), Central Burma on 14 September 1937 to British parents. He received his primary education in Trinidad, West Indies and at Bathgate Academy in Scotland before the family moved to Brisbane, Queensland. He attended Brisbane Boys College at Toowong and later the University of Queensland, where he commenced a medical degree. Bayliss was a fourth year undergraduate medical student when he joined the Royal Australian Navy, in February 1958, as a probationary Sub Lieutenant. Posted to HMAS Moreton he continued his medical studies in Brisbane and graduated in 1961. During university breaks he undertook training at HMAS Watson including a compressed air diving course. After graduation from Queensland University he completed his residency at Ipswich General Hospital and was promoted to surgeon lieutenant in January 1962. Lieutenant Bayliss joined his first ship, the survey vessel HMAS Diamantina, in February 1963. During his time on board as the ships medical officer, Diamantina escorted the Royal Yacht Britannia into Fremantle, in March, before conducting surveys in Australian and Southeast Asian waters including visits to Singapore and two visits to Bali (where the ship disembarked medical supplies to assist the local population). The latter visit, in September, was of concern to the ship's company as the Indonesian Government policy of Confrontation with Malaysia was increasing in intensity and as a precaution the ship was at action stations when in Indonesian waters. Surgeon Lieutenant Bayliss was appointed to HMAS Albatross in December 1963, but in June 1964 transferred to HMAS Rushcutter where he worked in the School of Underwater Medicine which was associated closely with the RAN Clearance Diving Branch which was then based at Rushcutter. Bayliss was promoted to Surgeon Lieutenant Commander in January 1967 and in November of that year joined the fast troop transport HMAS Sydney as the ships medical officer. During his time on board, Sydney undertook troop transport duties to South Vietnam on seven occasions (December 1967, January 1968, March 1968, May 1968, November 1968, February 1969 and May 1969). Surgeon Lieutenant Commander Bayliss completed his service in Sydney in August 1969 and then proceeded to England on exchange service and was posted to the Royal Naval Hospital Haslar in Gosport, Hampshire. On return to Australia Geoffrey Bayliss was appointed to HMAS Penguin, in January 1972, for duties at the RAN hospital. He was promoted to Acting Surgeon Commander in 1973 and assumed duties as the Deputy to the Medical Officer in Charge of the hospital. He was confirmed in the rank of Surgeon Commander in December 1973 and joined the aircraft carrier HMAS Melbourne in January 1974 as the Fleet Medical Officer. During his service on board the carrier undertook a deployment to the San Francisco, during February to March, to embark new Chinook helicopters for the RAAF. On completion Melbourne undertook work-ups and took part in Exercise KANGAROO ONE in the Shoalwater Bay area in June and other training in the Eastern Australian Exercise Area during October and November. The carrier was alongside at Garden Island in December 1974 when Cyclone Tracy devastated the city of Darwin on Christmas Day 1974. Melbourne was crash sailed along with most of the Australian Fleet on 26 December, as part of Operation NAVY HELP DARWIN, and arrived in Darwin on New Year’s Day 1975 to assist with the clean-up and rehabilitation of the city. The carriers medical department was heavily involved in providing support to the civilian population as well as maintaining the health of the ship's company who were working long hours ashore on clean up duties in excessive heat. Melbourne departed Darwin on 18 January 1975 and then deployed to Hawaii for Exercise RIMPAC 75 in March. On completion of this exercise she returned to Australia and undertook a major refit at Garden Island. In April 1976 Surgeon Commander Bayliss was appointed as the Medical Officer in Charge of the RAN Hospital at HMAS Cerberus. 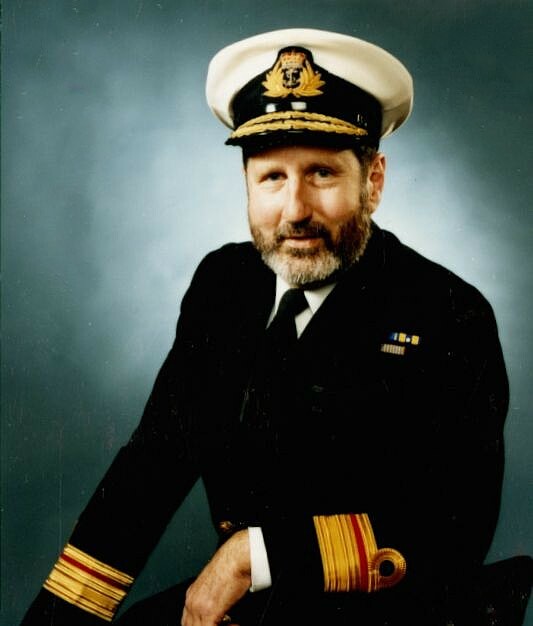 He was promoted to Surgeon Captain in June 1979 and took a years sabbatical leave before being appointed as the Medical Officer in Charge of the RAN Hospital at HMAS Penguin in July 1980. This position also carried the additional duties as Command Medical Officer for Naval Support Command. Surgeon Captain Bayliss was appointed as the Honorary Surgeon to the Queen in May 1981 and the following year was made a Member of the Order of Australia (AM), in the Queen’s Birthday Honours List 1982, for his services to RAN medicine. In mid-1985 Geoffrey Bayliss was posted to Navy Office as the Director of Medical Services-Navy. Two years later, on 31 July 1987, he was promoted directly to Rear Admiral and appointed as the Director General Naval Health Services. Rear Admiral Geoffrey Bayliss retired from the Navy in 1989. Since retiring he has been the chief of medical staff at the King Fahad Hospital at Al Baha in Saudi Arabia (1990-1993) and also been a medical consultant to various agencies.